Symone Sanders attends BET’s Social Awards 2018 It Girls Welcome Dinner on Feb. 10, 2018. Symone Sanders loves a good rant—which is great, because we love a good rant from Symone Sanders. The political strategist, former press secretary for Democratic presidential candidate Bernie Sanders and current CNN commentator has become well-known for her show-stealing, straight-shooting, mince-no-words delivery—which is only eclipsed by her deep command of American policy and commitment to progressive politics. In short, Sanders isn’t your typical political pundit. Her turn as a player in what was perhaps America’s most contentious presidential campaign in history brought this millennial powerhouse and Girls Inc. alum into our consciousness; refreshingly, she brought her entire self with her. Whatever you think about Sanders’ style or delivery, she is unapologetically herself. You know, I’m great now [that] I am getting to walk and live and be my authentic self. And I am out here encouraging black girls, brown girls, girls of all shapes, sizes and colors to walk in their authenticity. Because guess what? Becky and Sarah and whoever else, they get up every single day and they walk in their authenticity. They walk into rooms and they are themselves. And one day, it just clicked for me that I can walk in the room and be myself. So I can walk into the room with the candidates and order Hennessy if I want, because that’s what I’d like to drink. But also, talk to you about American trade policy, and how we have to have trade policies that work for American citizens and American workers, and not policies written by corporations. I can, yes, talk to you about the system of racism, and how racism is not transactional—it is a system that we participate [in] and perpetuate every day. And also talk to you about finance and the tax reform bill, and how it ain’t no reform, it’s tax cuts for the wealthy. I don’t have a work voice anymore. I don’t need a work voice because the way I show up—authentically myself—is professional. 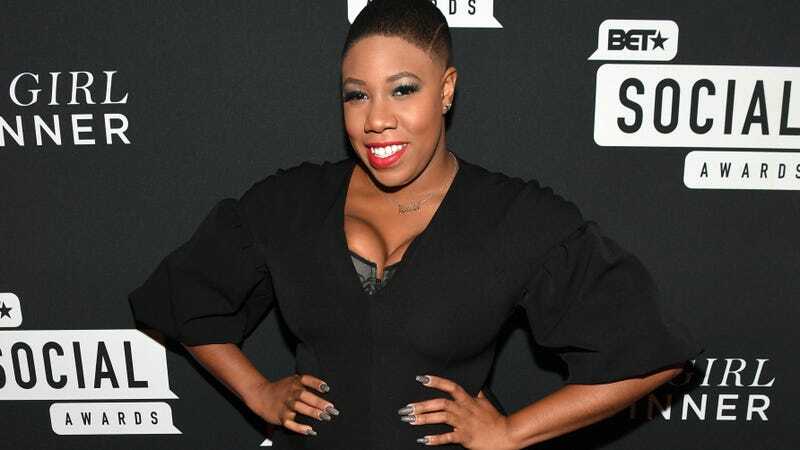 Symone Sanders speaks onstage at BET’s Social Awards 2018 on Feb. 11, 2018. Furthermore, me having busy nails does not preclude me from snatching you down with my words and explaining to you what the real is. I can absolutely do my job; I can type, I can do everything I need to do. [Y]oung black women still think that a standard of whiteness is what they have to ascribe to to be successful. So that lets me know that it is really important that I step out—every time I go to work—as my authentic self. I want young black girls to know that you can be bald and still be beautiful. I want young black girls to know that you can go to work and not have to agree with everything your white co-workers say. You can go to work and be your authentic self. You can show up and have nails, and they’ll still respect you. Because they respect me. My definition of feminism is I believe in equity, not equality—but equity for women in all spaces and places. And as a black woman, I have to be a feminist. Again—in my Angela Rye voice—we built this joint for free, and black women have shown up throughout history. In all the major moments in history, black women have been behind the scenes—or maybe even at the forefront—we just haven’t gotten our due. So I am empowered to walk in this feminism space, because as a black woman, it’s a space that I deserve to be in. I would like black women to know that we now have to demand what is rightfully ours. It is not enough for us to just continue to show up and save the world. We now have to show up, save the world, and then we need to demand what is ours. And so, in this moment, black women in many spaces are standing up and demanding resources, they are demanding titles, they are demanding seats at the table, and if they are not getting seats, we are snatching those things. And I think that’s what we need to do in this moment. So we cannot continue to just show up for everyone else. We have to now show up, do our jobs and make real demands, and be ready to dig our heels in if we don’t get them. Because we are way past our due, and we know we’re gonna continue to do the real work—we have been doing the real work. But we have to get our “just deserts,” as they say. So, black women, demand what’s yours.